Track workouts are a great way to build speed, prepare for a goal race, and train without having to stop for any traffic lights. However, especially if you live in an area with strict school security, tracks are not always easily accessible for public use. (Please do not get me started on how my alma mater won’t let anyone use their track. Reason number 150 I’m excited for our move.) So how do you get in speed work without a track to use? Fartleks! Fartlek means speed play in Swedish (and let’s not forget that the Swedes dominated running during the mid-20th century) and denotes a variety of speed workouts done away from the structure of the track. While fartleks can be completely unstructured and just be random pickups in the middle of a run, most fartlek workouts have you run for time and pace yourself based off of effort. For example, 10 x 1 min hard with equal recovery (plus warm-up and cool down) is a fartlek workout, where hard refers to the perceived effort that you run for one minute at a time. Besides not having access to a track, when and why should you consider swapping out traditional track workouts for fartleks? While many runners can train on the track without any adverse effects, other runners find that the repetitive motion of running the same direction in a small circle over and over again can give them injury. For other runners, the flat and fast surface of the track lets them push themselves too fast and end up with an injury from going too fast too soon. Fartleks can be done on flat stretches of road that avoid repetitive motion and add some variances in terrain to keep you from hitting the pedal too hard to the medal, so to speak. Let’s be realistic: speed work is hard, and every once and a while, we need to give our bodies a well-earned rest from the hard work of training. Usually the best time to do this is after a race, when you should focus on rest, recovery, and easy running, or during winter, when your favorite track or trail is possibly snowed over. Once you come back form this time off from hard running, you need to ease back into faster efforts. Since you run fartleks for time according to effort, you won’t be trying to pound out 12 x 400 meters at the same pace you ran while in peak shape a few months ago. 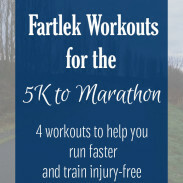 Fartleks let you run based on your current fitness, rather than where you were or where you want to be. Unless you are in college or a professional runner, chances are you do not race on the track but rather on the roads. Roads can be a lot hillier than the track! Running fartleks on the roads prepares you for racing on the roads, because you will have to learn to maintain speed while climbing hills and navigating changes in surface. The roads also are a harder surface than the track, so your muscles and joints will adjust to absorb the shock of the roads—something that your body will also endure on race day. While many people may disagree with me on this, the track can be a little boring sometimes. Mix it up every once and while by running fartleks on a scenic trail or stretch of road! Fartleks are also fun because you can enjoy the freeing sensation of running fast without being as concerned about checking the clock or the markers on the track. I use an interval timer app so I can keep my eyes off my watch and the clock and just pick up the pace whenever my phone beeps. 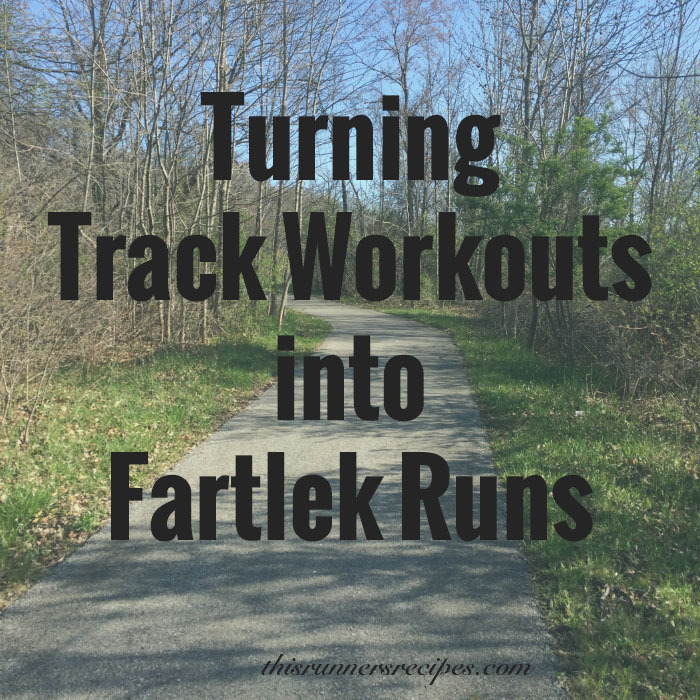 Know that you know why you should include fartleks in your training, especially during base building phases or the early weeks of training, how do you go about turning track workouts into fartlek runs? While you don’t want to push yourself to hit a certain time goal or anything, you also don’t want to lose out on the benefits of fartleks. Aim to run your fartleks at a hard effort that requires a recovery jog between each interval to steady your breath; if you go too easy, you won’t reap the speed-building benefits. You want to be breathing heavily, at about one breath in for one footstep and one breath out for one footstep. Use your most recent race time to determine how long your fartlek intervals will be. Your 5K and 10K times (or equivalent times if you’ve done only half marathons and marathons recently) will provide a guide. 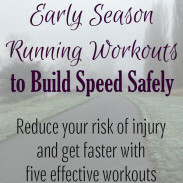 Say, for example, that you want to run a fartlek workout similar to 800 meter (1/2 mile repeats). 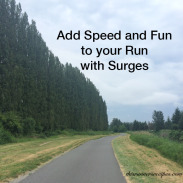 Instead, try to run repeats of 4-5 minutes at a hard effort, since for many runners 4-5 minutes of running will equal about 1/2 mile or slightly more. You can do the same thing with mile repeats and other distances; if your 10K time is a roughly 8:00minute/mile pace, then run 3-4 x 8 minutes at a hard pace. Whenever you are running fast, proper form is essential for maintaining pace and preventing injury. Take short and quick steps and keep your feet underneath you, rather than overstriding and taking long steps. Keep your shoulders up and relaxed and your gaze ahead of you, so that you don’t slouch forward. Try to focus on driving your steps out of your glutes and pump your arms beside you at an relaxed angle. Do you prefer fartleks or traditional track workouts? What’s your favorite: track, trail, or road? —> Road for me! I’ve been a big fan of fartlek work for years, for just the reasons you list. I think it’s perfect as you ease into more structured speed, especially. I’m glad to know I’m not the only other fartlek lover! 🙂 Your post a few weeks ago on doing mile repeats on the road definitely inspired me to write about fartleks. Great information! I do like to do fartleks. It’s sort of freeing to run fast just to run fast without a time goal. I prefer running on trails. It is so freeing to run without a time goal, and I’d imagine even more so while running on pretty trails!